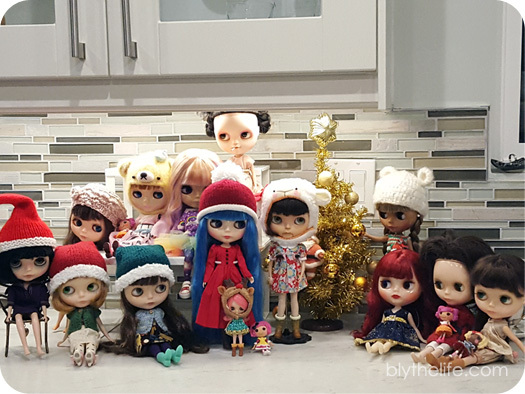 BlytheLife.com » QOTW: Getting your dolls gifts for the holidays? QOTW: Getting your dolls gifts for the holidays? This is a question that I get asked from time to time, especially around December. Do I get my dolls gifts for the holidays? The reality is that when I get them a gift, it’s really a gift for me! Things have gotten more expensive this holiday season as I’ve had to expand my list of people to shop for, so it has turned into less shopping for me and more shopping for others. Which is really what the season is supposed to be about (giving, being generous, thinking of others). I might get my dolls some little gifts post-holidays when I’m not feeling the pinch as much from the shopping. Some new shoes, perhaps some more separates, and then more knitting to be done for the dolls! If you have any shops to recommend to me, leave the links below in the comments to help me out a bit. What was something nice that I have done for the holidays was go to the annual Christmas meet with Vancouver Blythe Bunch – definitely a gift in itself! It’s felt like forever since I’ve had a good amount of dolly fun (our last meet was a Halloween meet! ), so it was great to see people, sit, relax with some colouring, chatting, and ooh-and-ahh over dolls and their outfits. Are you getting your dolls gifts for the holidays? QOTW: Giving gifts to your dolls? QOTW: Did you get new dolls for the holidays? Unfortunately, my doll will not be receiving anything new these holidays. Not from me, at least. I feel a little bad saying that as I only have one girl but all my money at the moment is going towards the loan I took out from my parents for my brand new, pre-ordered UFO A Go-Go (yes, I took the plunge). She arrived today. So happy! I can definitely recommend a shop for some lovely Blythe goodies. It’s called MissFreyaJ and can be found on etsy. She is taking a break for Christmas but will be back in the new year. She’s from Australia and makes the most gorgeous Blythe dresses, eyechips, pulling sets, custom dolls and more! She’s one of my favourite sellers and I can’t recommend her enough.